If anyone knows anything about me, I am a heavy LinkedIn user. And by “heavy” I mean a going-to-sleep-and-waking-up-with-LinkedIn user. However, today I will ignore my unconditional love for LinkedIn (okay, I might have exaggerated a little bit, but it’s still a pretty cool social media platform), and I will give you my un-biased opinion on LinkedIn’s Premium plan for job seekers and whether it is worth the price. If you are new to LinkedIn, I will introduce you briefly to the platform, and I will explain the features that come with the Free plan and the Premium subscription plan. If you’re already familiar with these terms and you’re just trying to decide whether to upgrade your current plan, you can skip all the way down to Section 2. LinkedIn is a business-oriented social media platform that encourages networking and exchange of information between professionals. It was founded in 2002 in California, USA, by a couple of very smart guys in suits, and it reached its first 1 million users in 2004. Today, there are more than 64 million people networking on the platform! LinkedIn’s purpose is to cultivate and nurture strategic relationships, and build a network of valuable connections that can become potential partners, employees, employers, or can simply help you to keep your job opportunities open. Similar to other social media giants like Facebook, Instagram and Google+, you have a feed where you can read the latest news, publications, articles, job offers, and opinions in your fields of interest. As a person with Marketing background, my feed is usually full of interesting Marketing topics and trends, controversial opinions, tips and advice, and every once in a while a job offer from a contact of mine or a person I follow (the job offer is not directly for me, it’s rather a general message that appears on my feed, and reaches everyone who follows or is connected to that person). 2. How exactly does LinkedIn work? Connections: connections are a fancy equivalent of “friends” on Facebook, but because it’s a professional platform, we have to keep things formal. In other words, once you’ve registered on the platform, you start connecting with people by adding them to your network. LinkedIn suggests you people that you might know or you might have worked with to make it easier for you to get started with it. Connections level: if you are new to this platform, you might be wondering what is the difference between 1st, 2nd and 3rd connections. It’s simple: 1st connections are the ones that form a part of your network, 2nd are the connections of your connections, and 3rd are all the people outside of your visible network. My Network: in the upper right section you will find all your current and pending connections in one place. Feed: as I already mentioned, once you start adding connections to your network, everything they post will appear on your feed. Jobs: although LinkedIn’s main function is not a job portal, it does have a section where you can post job offers if you are a company, and apply for them if you are a professional. I will definitely cover this in detail in another post, as I personally find the Job section really interesting. Messaging and Notifications: I think that these are quite self-explanatory, so let’s move on to the next part. 3. What pricing plans does LinkedIn offer? There are different pricing plans for Recruiters, Job Seekers, and Sales Professionals, and today we are going to talk about the Job Seeker one (the plan I am currently on, and the most popular of them). As you can see, it comes with the price of 26 EUR per month, and although it’s the cheapest Premium option, paying almost 30 EUR for a social networking platform is not a low price for everyone unless it’s really worth it. In the next section, I will break down the Premium Career plan feature by feature, and I will discuss the utility of each one of them. To make it more fun (because what’s life without a little bit of fun), I will provide a personal rating as well. Section 2: Is LinkedIn Premium worth it? What is it? The Featured Applicant feature means that when you apply for a job position on LinkedIn, you can be positioned at the top of the applicant list, making you stand out among other applicants. Why is it helpful? When you start applying for jobs, you will notice that…you are not the only one (oh thanks, I didn’t know that). For some of the most popular jobs, there will be more than 500 applicants, meaning that the possibility of the recruiter viewing your CV is getting lower. Even if you fit the job position perfectly, they might not even get to open your CV at all just because there are hundreds of other CVs before yours. This feature positions your CV on the first pages of the Recruiter’s dashboard, before the ones with non-Premium account, increasing significantly the possibility of your profile being viewed – thus, increasing your chances for an interview invitation and for scoring that job position that you wanted. Review: In theory, this feature sounds awesome, and it’s definitely one of the best perks of the Premium LinkedIn plan. In reality, I have absolutely no way to see it in action, so I have to trust LinkedIn on that; but I have to admit that I usually receive more attention from companies when I have it activated. Disclaimer: A good positioning on your recruiter’s listing doesn’t substitute a good CV, so don’t forget to update your CV and tailor it according to the job you’re applying for! What is it? The Open Profile feature makes your profile open (Captain Obvious strikes again) for people outside your network. In LinkedIn, you can’t send direct messages to people who are not your first connections, so this feature allows you to send Open Profile messages to all Premium members who have enabled this option (without additional cost). Why is it helpful? Having this feature activated makes you easily reachable by everyone without necessarily establishing a connection. It could be very helpful for Sales people who want to improve their communication with other professionals, jumping over the connection bareer. Review: My experience with this feature is a solid zero, so I don’t think it would be fair to leave a review or a rating for it. If we look at this from another perspective, it is possible that I haven’t used it because I don’t see a utility in it – but I will give it the benefit of the doubt. Rating: No rating due to the fact that I haven’t used this feature – but if you have, you are more than welcome to leave me a feedback! What is it? With the Free plan, you don’t have the full visibility of seeing who has viewed your profile: you get notifications that it has been viewed, but it doesn’t always show who has been this person. With this feature, your curiosity for knowing who is interested in your profile is greatly satisfied! Although sometimes, maybe 1 out of 20 times, there is a view from a recruiter or another person whose profile is not accessible – I assume it’s because they are outside of my network or because they have configured it that way. Why is it helpful? It is good to know whether recruiters have been looking at your profile because it might give a hint about a potential job offer, but I think this feature is more to fulfill your curiosity rather than help you find a job. Even if a recruiter has seen your profile, it only makes sense for them to contact you, so you can’t do much about it except for waiting. On the other hand, if you know beforehand that a HR professional is interested in your profile, you could use that to prepare for the outcome. But don’t rely too much on this; people are curious by nature, so a recruiter visit doesn’t necessarily mean an interview. Review: I think it’s a nice feature to make you conscious about the people who are interested in your profile, and you could even add them as connections if you see a potential for a collaboration. Other than that, it doesn’t help that much for job seeking. What is it? The InMail feature lets you send messages directly to people that are out of your network without the need for connecting with them. As you can see in this example, these people are 3rd connections to me, meaning that we don’t have any connection in common, but I can still reach them via InMail. However, InMails are not unlimited because LinkedIn takes a very good care of reducing the possibilities for spam. Instead, you get credits per month, and for the Job Seekers plan you get 5 InMails per month – which you can accumulate for 90 days before their expiration if not used. Why is it helpful? It’s a great feature for sending direct messages to people outside your network who don’t have an Open profile, without the need for establishing a connection with them. It is definitely worth it if you are reaching out to an important potential client or a recruiter. Review: I think it’s one of the best features of this plan, and although 5 InMails per month is not too much, it only comes to show that quality is always more important than quantity. So use them wisely! If you are a job seeker, you can identify potential decision makers within the company you would like to work for, and use InMail to contact them for a job (always following the best practices of course). Rating: 4.5 / 5.0 – worth it! What is it? LinkedIn Learning is a relatively new feature that offers a great variety of courses relevant to your goals or job function. Additionally, the platform uses intelligence to create personalized recommendations based on your skills and interests, helping you improve in your field. Out of all features, it is my absolute number 1; I think LinkedIn has done a great job on hiring the right professionals and preparing the right courses to make you really understand everything you want to learn. Why is it helpful? Besides from the obvious reason that you gain a valuable knowledge and become a better professional, you get a certificate after successfully completing each one. It is not an official certificate that immediately makes you an expert, but it is a great addition to your CV or LinkedIn profile, and it shows that you are thirsty for knowledge. I personally love all the courses I have taken so far, they are entertaining, very well-explained, and very well prepared. The mobile version is great as well; because it allows me to watch the videos on my way to work and back home (which is an hour and a half that I would otherwise waste in playing games or browsing Facebook). Review: Nothing more to say: my personal favourite! What is it? LinkedIn uses analytics to give you insights when seeking job opportunities: whether you are a top applicant for this job, whether your skills match the skills required for the position, what level of seniority have the other applicants, and how your current role and past experience compare to the rest. Why is it helpful? It serves as a guiding point to understanding where you’re situated among other applicants and what are your possibilities for getting the job. In the section Skills, you can get ideas about adding new skills to your profile for a better match (but don’t go overboard either). Is it really helpful? Review – It is a nice feature to help you understand your potential for scoring the job you want, but you have to take into account that LinkedIn filters and algorithms are far from perfect, and being in the top 10% or 25% of X applicants is not always true. On the other hand, I think it’s quite useful to see how many people have applied for the job. Rating: 3.0 / 5.0 – LinkedIn definitely needs to work on improving its algorithms for matching your profile with the job position. I keep getting suggestions where the position requires native Chinese or Portuguese, and I am in the top 10% of all applicants, without having ever studied these languages in my life. THE CONCLUSION: Is LinkedIn Premium worth it? Let’s be honest, job seekers have it particularly hard on LinkedIn regardless of being Free or Premium users. I am not sure why is that so, maybe due to its nature as a social platform instead of a job portal, but a lot of people I’ve talked to reported that they have never gotten a job from this platform. And I don’t mean to discourage you – there are also people who scored a position on LinkedIn, just don’t get limited to it if you are actively looking for a job. In my opinion, the only feature that makes Premium really worth it for job seekers is the Feature Applicant, but if you are going to pay almost 30 EUR only for getting the benefits of one feature, maybe it’s not worth your money. I think that the price is too high for not getting that many benefits, and the right corresponding price for them would be at least 2 or 3 times less. Besides from this feature, the others can be very useful, but you have to really know how to take advantage of them in order to see the worth of your money. And taking into account that LinkedIn is only one of the many portals where you will be seeking a job, you might want to invest your 30 EUR into tailoring a beautiful CV or getting professional advice on job application. In my opinion, and feel free to correct me if I’m wrong, LinkedIn Premium is worth not for its job seeking features (as you would expect), but for LinkedIn Learning. I am not looking for a job at the moment, but I kept my Premium account only for the online courses that the platform offers, because they provide a really valuable and career-specific knowledge that you will not get in many other places. For example, I learned a lot about CRM tools such as Salesforce and Hubspot without having to request a demo from their respective platforms in order to explore their services. Of course, I would be happier if it didn’t cost that much, because I am a student at a part-time job, but it is still a great way to dedicate your time on something valuable that makes you a better professional. The features that LinkedIn offer for Premium are much more useful for establishing a high-quality network with InMail, Open Profile and profile views, as well as gaining additional knowledge with LinkedIn Learning. However, they don’t seem to be that useful for job seeking. Conclusion – for whom is it worth it? 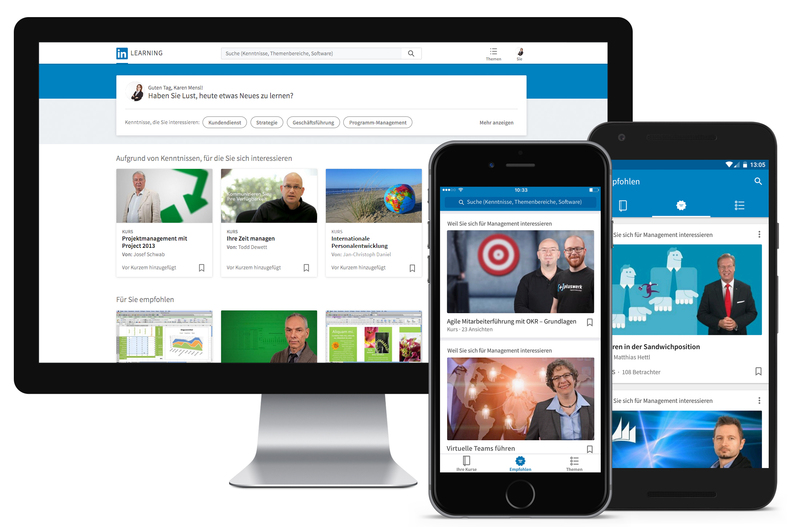 If you are a person who has a job or is not actively looking for one, and you don’t mind paying 26 EUR per month – definitely take advantage of LinkedIn Learning! If you are a person who has a job or is not actively looking for one, but you are unsure whether LinkedIn Learning provides you with any additional value, you have a 30-day free Premium trial to find out whether it’s worth it for you!